looks so cozy! great work. Which is your favorite square? yeah I was gonna say that one stands out the best. 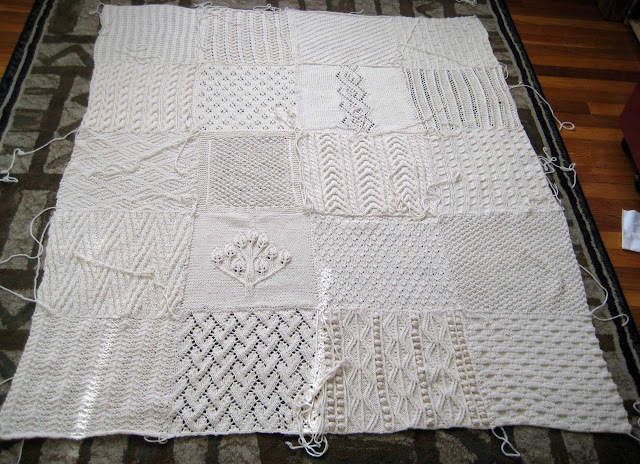 The squares in the afghan are approximately 12 inches square. 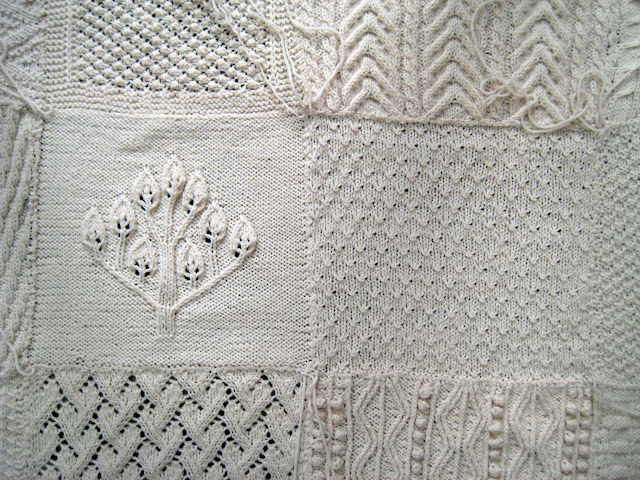 I found I had some variety with the squares in the book, but it was easy enough to organize the overall afghan so slightly wider squares were in the same column. This looks wonderful, I loved reading the story on the progression. The square that is most *standing out* to me is The Tree of Life. Awesome! Jody, That was a fun square to make (even though I made it twice). My only regret with the whole project is that I wish I had learned how to create charts out of written patterns sooner, it would have made the more complex patterns so much easier! 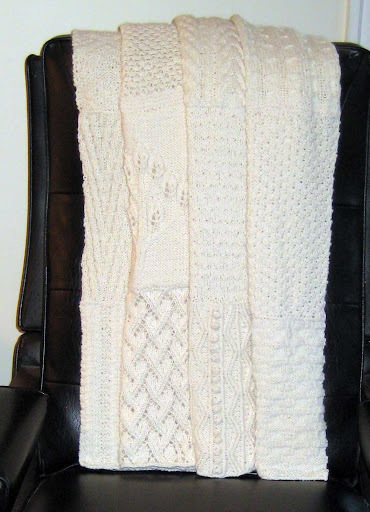 hey i just bought that and i bought the great american aran afghan too..now i cant decide ugh...i know its def gonna be a labor of love..i wanted to thank you again for all the help with creating my own charts from graph paper. 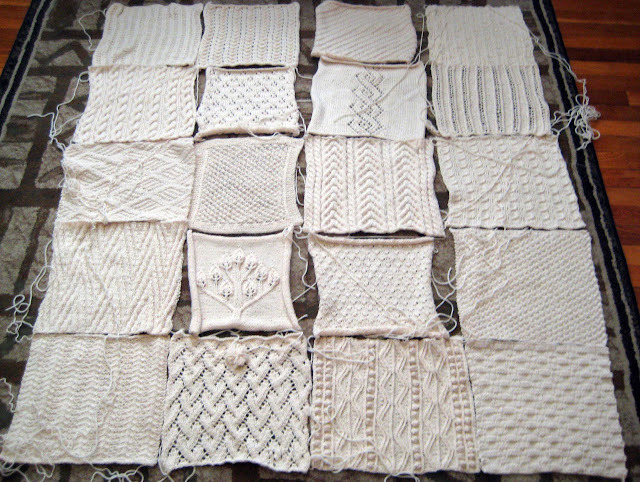 That Sample square blanket project is going well, slow but well..my dream is to knit this aran one..3yrs huh? 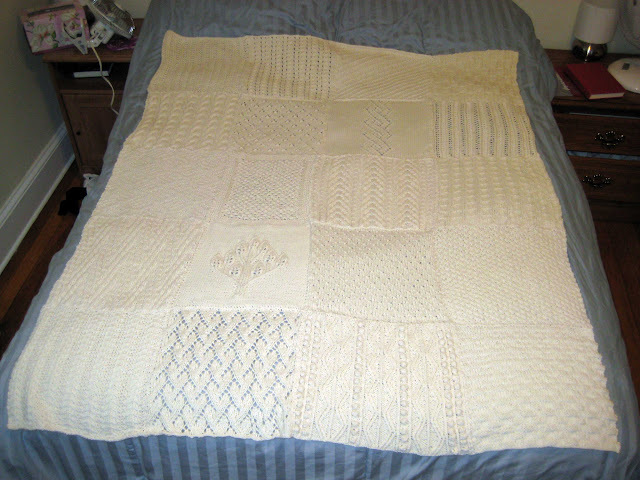 your blanket is lovely..
oh my gosh you must be a speedy knitter.being new i really had no idea how long such a big project like this takes..im still a newbie..and though i haven't knitted a 12 inch square before remember back a bit when i asked for your help with how to chart my own picture from graph paper?? 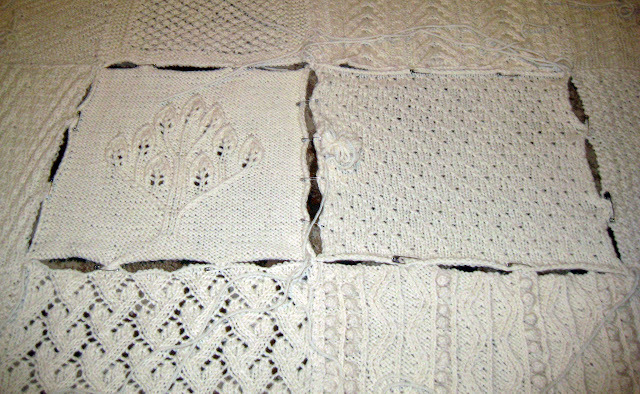 well even still i only have 6 blocks complete.i do have at least 4 or 5 projects going on too..i told myself no more new projects till i finish the others...im gonna need a whole lot of these 32 stitches by 50 plus row squares to cover a queen size bed..i had wondered when i begin the aran blanket how long it would take..i was guessing 6 months to a yr..heck i been working on the same checkered scarf for my husband since this past november lol..i was thinking out of all the blogs on knitting ive seen, yours is the only one i been too over and over again..i just found a free software that will give me knitting fonts, graph paper thats made specifically for the stitch and row gauge from the swatch plus you can color the graph paper if you want to make a colored knitted picture or a solid color raised picture..i hope you dont mind but ill probably have questions for you when i start the aran block blanket.. I never mind answering questions! 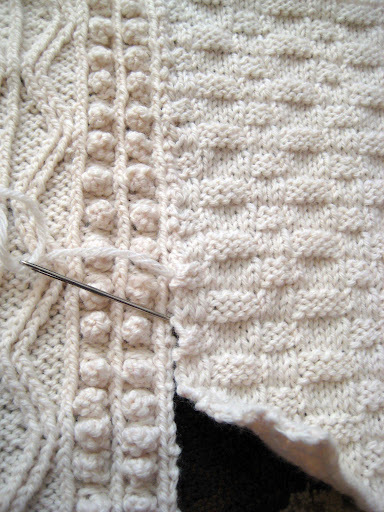 I started this blog because I thought that some things from my own knitting experiences could help other people. 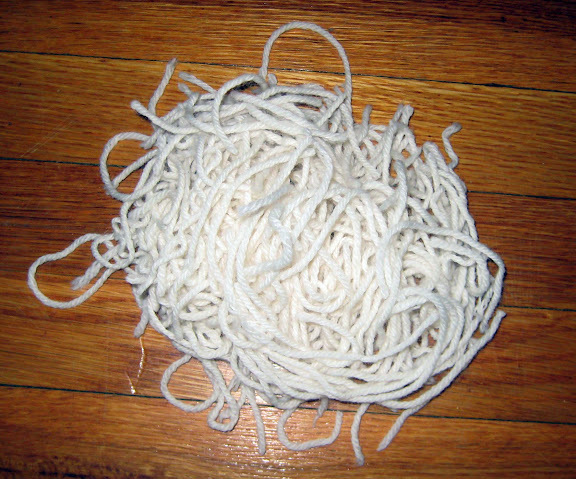 Having a lot of projects going at one time will slow things down. 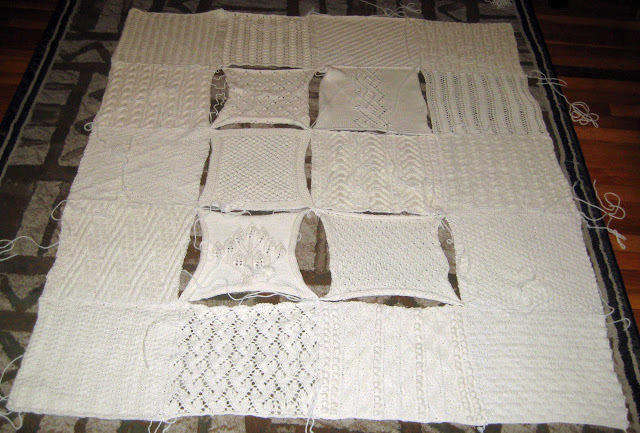 If you get bored with the afghan, try making one square in between each of your other knitting projects. Then you can have satisfaction of making progress.